I’ve been struggling with fitting these Clover pants for days already, now this! I didn’t figure out I had the grainline going the wrong way until I cut the last piece. Was loving this bright red stretch cotton too. Oh well. 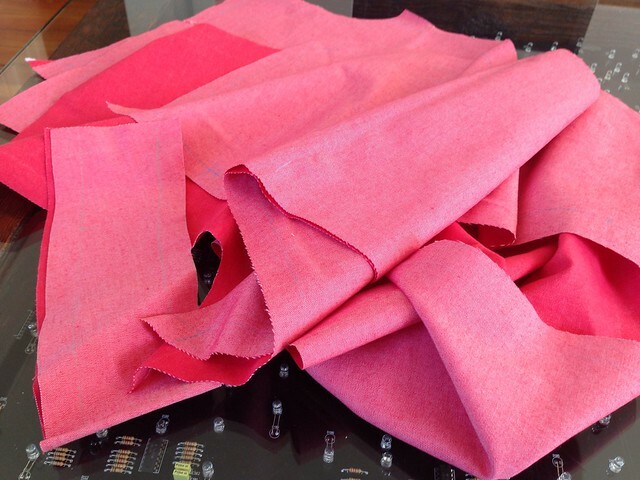 Time for new fabric. 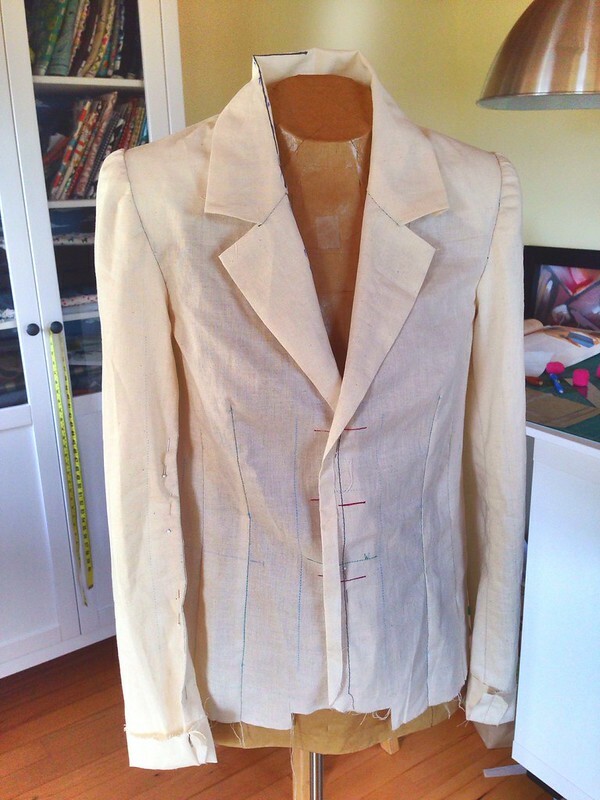 Wow, I can’t believe how long it takes to tailor a custom jacket! When our instructor told us that it takes 30-40 hours to complete, it didn’t really sink in. That number feels pretty real to me now. With all of the test swatches I had to do, plus the learning curve, I’d say I’m up to about 60 hours already. I’ve never sewn anything this complicated, ever. But, it is pretty sweet to learn such a timeless craft and get a little boost in confidence for future projects. 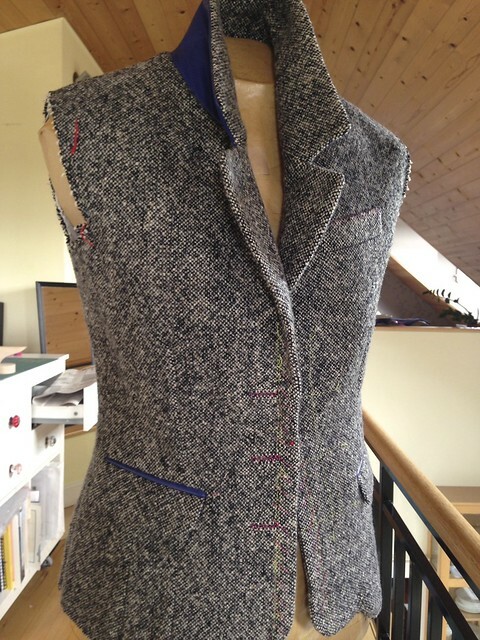 For the time being, I’m completely focused on my tailoring class which is no small undertaking. 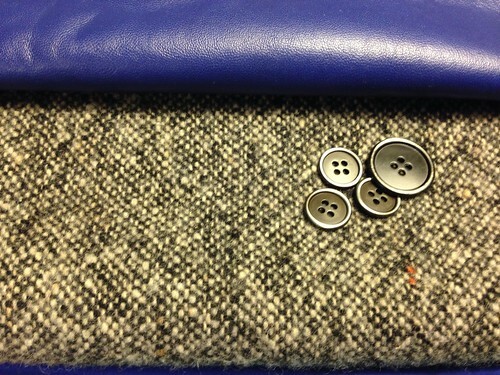 I’m making a tweed blazer based on McCall’s M6172 that Sunni of A Fashionable Stitch used for her plaid blazer. I made a couple of muslins using the smallest size, the final one pictured above. I added an extra button in the front, altered the roll line, changed the pockets, and added vents to the sleeves. My friend Terry McClintock was kind enough to assist me with fitting over at Stone Mountain and Daughter in Berkeley where she is an amazing sewing instructor. I was supposed to have this test garment completed by the first class. Since I enrolled on the morning of the first class, I was already behind! Instruction started with the basics, assembling our supplies, drafting the support pieces, and cutting our fabric and interlinings. I selected a soft cobalt leather for the under collar to add some pop. The cool color theme also appears in the lining and buttons. I like the way it contrasts with the warmth of the tweed fabric. In terms of construction, we spent a good deal of time talking about seams and pressing, which involves a whole host of special accouterments. 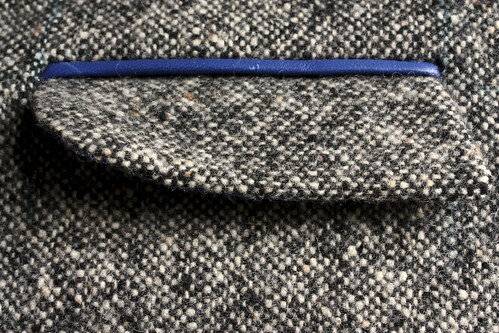 This week, I made my first bound buttonhole and double welted pocket. Thank goodness we worked samples first to avoid destroying our jacket pieces as we try out the techniques. What’s wrong with this picture? Oops, the grainline is going the wrong way on my pocket flap. Some folks cannot be bothered with such details, understandably. They are quite fiddly! Personally, I find the work very satisfying. 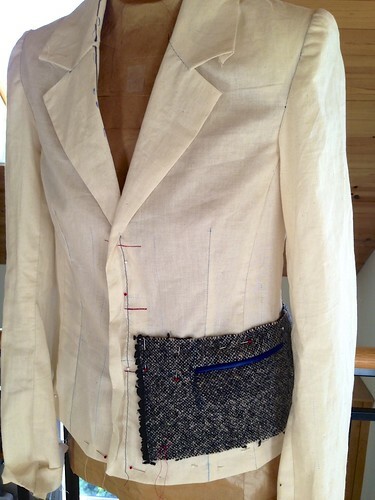 I greatly admire the craft of traditional tailoring, especially the hand work. 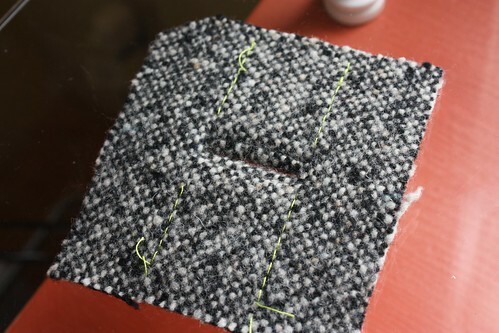 I thoroughly enjoy manipulating and shaping wool fabric. The construction process feels like a cross between sculpting and origami. I find it refreshing to slow down and take the time to invest in producing a fine garment that will last.